1. It is indeed a privilege for me to visit your beautiful country once again. I wish to express my sincere gratitude to you, Madam President, for the warmth of the welcome, the graciousness of your hospitality and the friendship of the people of Nepal. I am deeply touched by the overwhelming affection with which I have been received in Nepal. 2. India and Nepal share age-old historical and civilisational links. Our people have always maintained close ties of friendship and co-operation. The socio-economic, cultural and people-to-people ties between our two nations reinforce the warm relations and mutual understanding that exists between our two Governments. These special bonds are at the heart of the India-Nepal friendship. They are the real drivers of our partnership; they provide vitality and dynamism to our unique, time-tested and multi-faceted relations. I believe, Madam President, that the destinies of our two countries are inter-linked. We have a vital stake in each other's wellbeing and prosperity. 3. The people of Nepal are engaged in a historic undertaking - of consolidating the gains of democracy, achieving progress and ensuring that benefits reach each and every citizen. I applaud the enterprise and achievements of the people of Nepal in their quest for peace, stability, progress and all round development. The commitment of the people of Nepal in pursuing this transformation is truly commendable. They seek to achieve their objectives within a federal and democratic framework, taking on board all sections of society. They seek to accomplish a Constitution that responds to the needs of their diverse social fabric. We wish you all success in this noble endeavour. 4. I salute the resilience of the people of Nepal in the face of acute adversity. The natural disaster that struck Nepal last year caused untold hardship – and, as it always seems to happen, the weakest sections were the worst affected. At this time, and rightly so, the people of India considered it their duty to come to the assistance of their brethren in Nepal as swiftly as possible. India remains committed to help as required – and will support the Government and people of Nepal in reconstruction of their homes and their lives. 5. India has an abiding interest in the socio-economic development of Nepal. 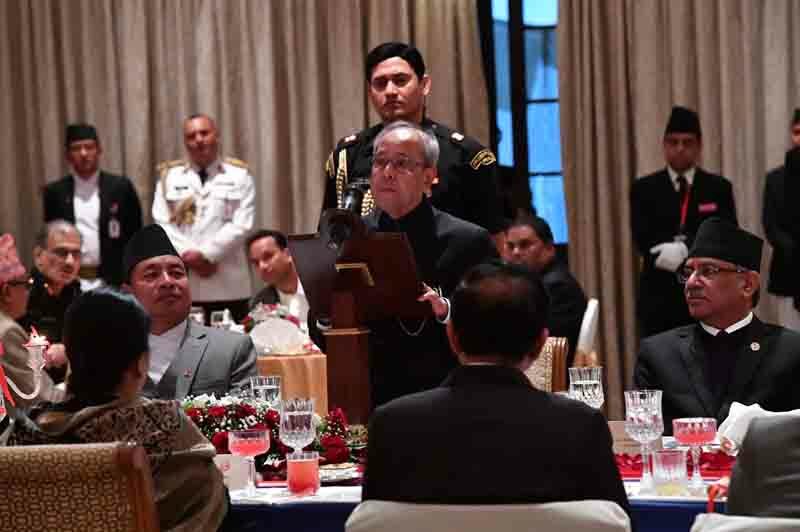 As Nepal’s closest neighbour, India takes pride in the achievements of the people of Nepal, and in the success of her development partnership with Nepal. The canvass of our bilateral cooperation covers all dimensions of human endeavor. We have created robust institutional mechanisms to monitor our joint work. 6. Our regular high-level exchanges are a hallmark of our bilateral relationship. They demonstrate the high level of confidence that we have in each other and our commitment to leverage our resources and expertise for the progress of our peoples. Today, our youth have the opportunities to realize their aspirations. It is our sacred duty to equip and facilitate their pursuit of economic prosperity and development. 7. Excellency, the rapid economic transformation that is taking place in India presents unprecedented opportunities for the people of Nepal. We invite them to be a part of India’s growth story. Together we can and must achieve the full potential of our ever-expanding mutually beneficial cooperation. We have together prioritised some areas of our common interest – including trade, mutual investments, defense and security, agriculture, hydro-power, infrastructure development and connectivity projects. India remains ready to extend all possible support in accordance with the requirements of the people and Government of Nepal. 8. Excellency, the common challenges that we face in the 21st century, will necessitate an environment of peace and security in our region and beyond. Terrorism, today, poses the most serious threat to our peace and security. The international community will need to work together. We will need to foster tolerance and understanding in all societies and eradicate the scourge of terrorism. Similarly, it is only a collective, globally co-ordinated effort that can effectively address the adverse impact of climate change. 9. Rapid technological advances have opened up vast opportunities and the world is becoming increasingly inter-dependent. India remains committed to promoting regional and sub-regional cooperation. India was honored to welcome Prime Minister Prachanda and other leaders from the BIMSTEC countries to the BRICS-BIMSTEC Leaders' Outreach Summit in Goa to discuss ways to enhance regional cooperation. 10. Working together, our nations can do a lot. India attaches the highest priority to its relations with its neighbours – particularly Nepal with whom we have the closest fraternal ties. 11. India is committed to further strengthening and expanding these ties and we know that so is Nepal. As sovereign nations we have ensured that our partnership is based on utmost trust and respect for each other's interests and concerns. We share the confidence that through this approach we are bound to succeed. With these words, Excellency, I would like to most cordially reiterate my invitation to you to visit India. I look forward to the pleasure of welcoming you in New Delhi. - to the successful co-operation and enduring friendship between India and Nepal.